Movie studios are looking into giving iTunes earlier access to home-rentals, but only if Apple can prevent the movies from being pirated. 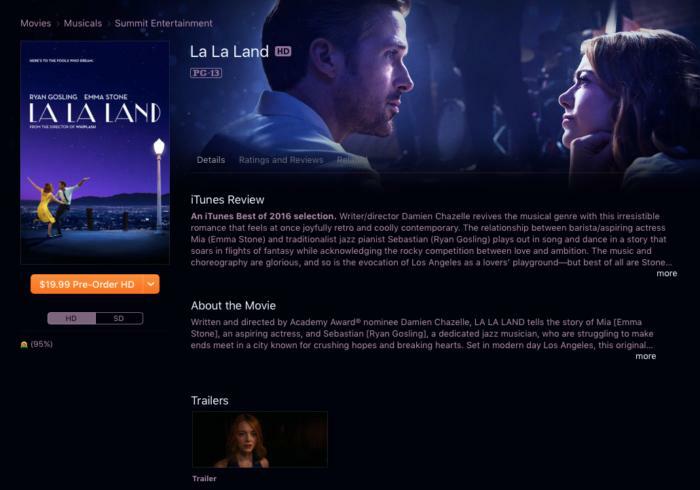 New movies could be coming to iTunes just days after the theatrical premiere. Apple is reportedly pressing film studios to make movies available to rent on iTunes just two weeks after they’re released in theaters. According to Bloomberg, Warner Bros., 21st Century Fox, and Universal Pictures are looking into allowing for these earlier home-rentals and are considering striking a deal with Apple to have them on iTunes. The deal is far from finalized, however, and the movie studios could end up choosing another platform, like Amazon or Google Play, according to the report. So, it sounds like the studios are looking to pick just one platform to exclusively offer earlier rental as a way to secure a better licensing deal. Early home-rentals would come at a premium, of course, potentially costing somewhere between $25 and $50. At first, this may sound very expensive for a 24-hour rental, but considering the average cost of a movie ticket is now $8.73, it might actually be cheaper than taking a family of four to the theater. Studios typically give movie theaters a 90-day exclusivity window for theatrical releases. Then, movies are made available on DVD and to rent online. In recent years, there’s been pressure by the studios to narrow this window down because movie theater attendance and home-movie rental revenue have remained stagnant. According to Bloomberg, Warner Bros. C.E.O. Kevin Tsujihara said that earlier rentals could also help deter online piracy, which continues to plague the movie industry. In fact, the movie studios don’t entirely trust Apple to be able to prevent their movies being pirated from iTunes. While Apple does encrypt the movie files so they can’t be redistributed, there’s nothing preventing viewers from recording the movie with a camera and uploading it online. Napster co-founder Sean Parker has offered a solution to that very problem. Back in March, Parker promised a new service called Screening Room that would offer early home-rentals and employ watermarking technology to track down leaks. And movie theaters may finally be coming around to the idea of a shorter theatrical window, but viewers will still have to wait. According to Bloomberg, it will take 18 months for studios, theaters, and the exclusive technology service to agree and launch early home-rentals.